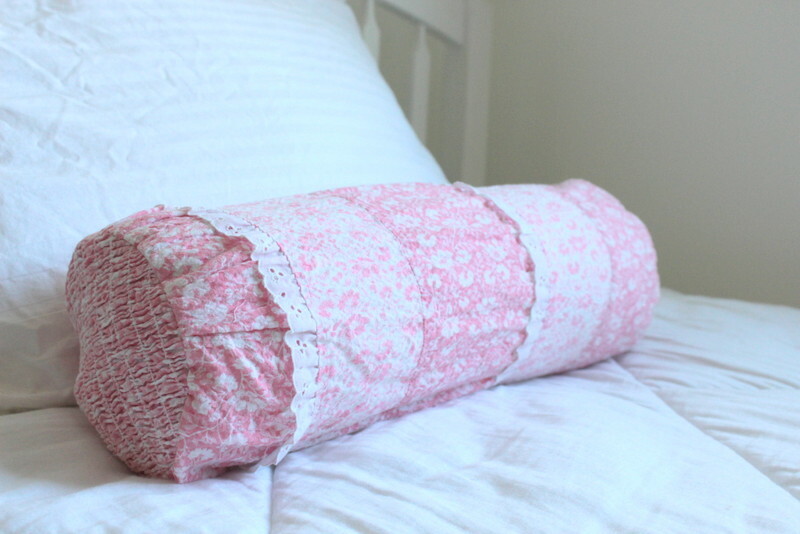 What could be more sweet than a bolster pillow made from an old dress? 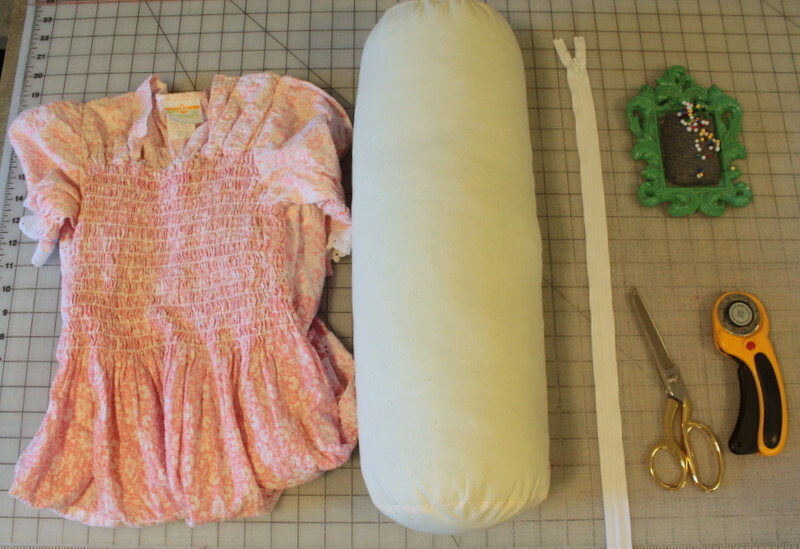 My neighbor asked me to create a memory pillow using a dress she wore as a young girl. 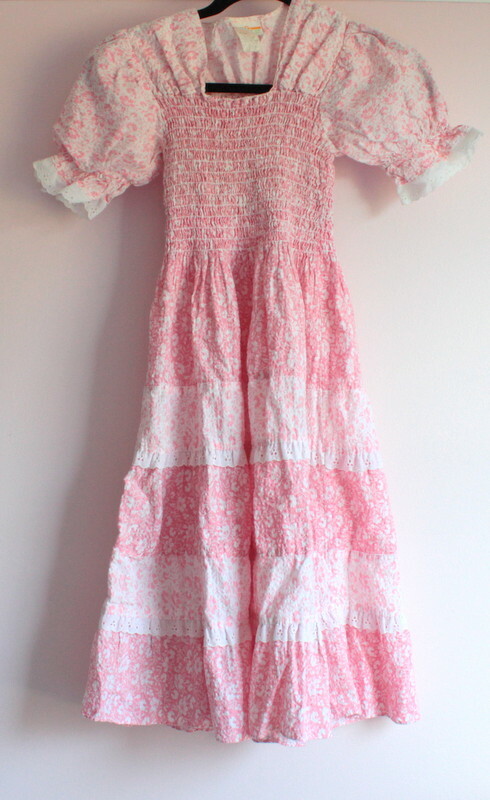 The dress was about 40 years old. 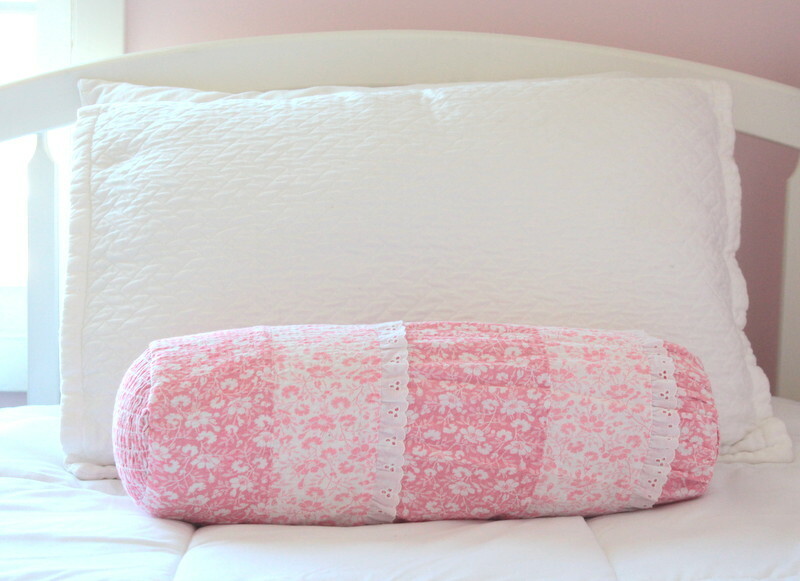 She suggested a bolster that her daughter could use. This was not a rush project, so it sat in my queue for a while. 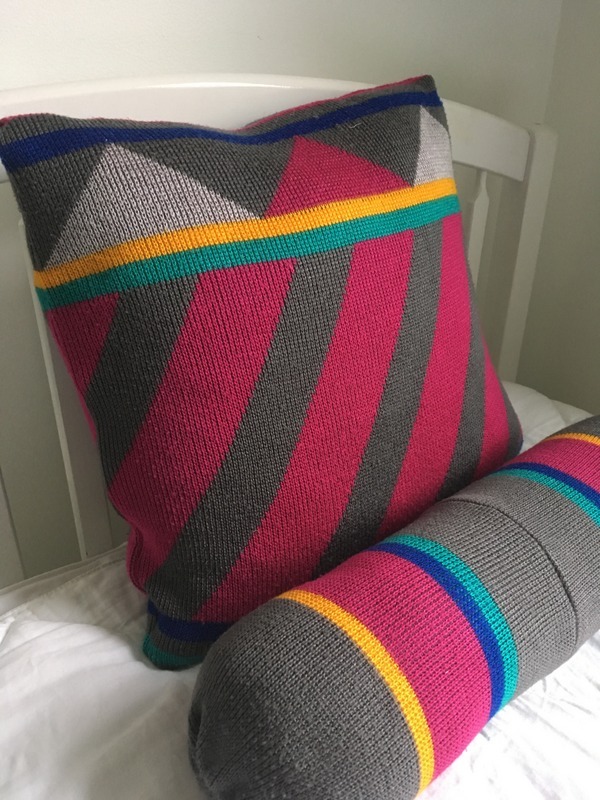 And then Pillow Cubes asked if I’d like to collaborate on a project and the bolster pillow came to mind. 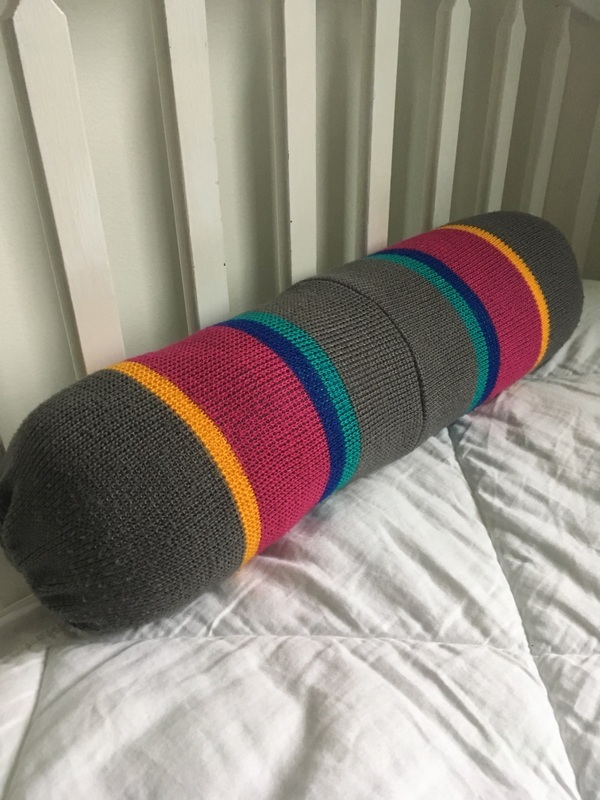 Interestingly, I had never sewn a bolster and then last week had a request to upcycle a sweater into one. 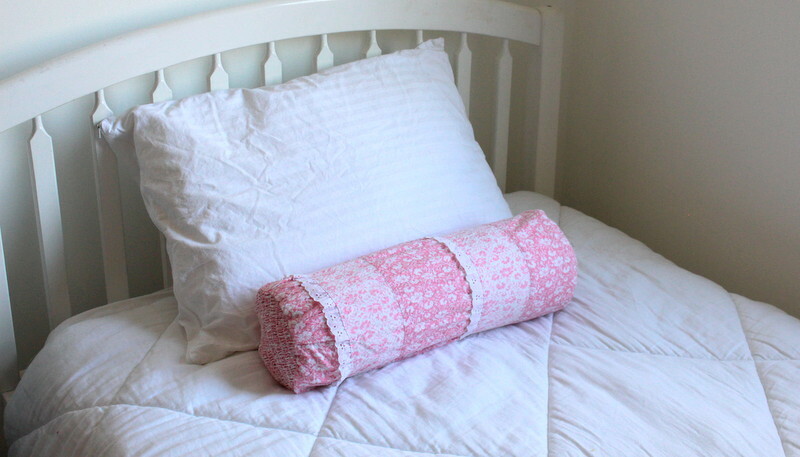 To create this project, you need enough fabric to go around the bolster. A little math helps, here. I selected a 5″ x 18″ bolster. 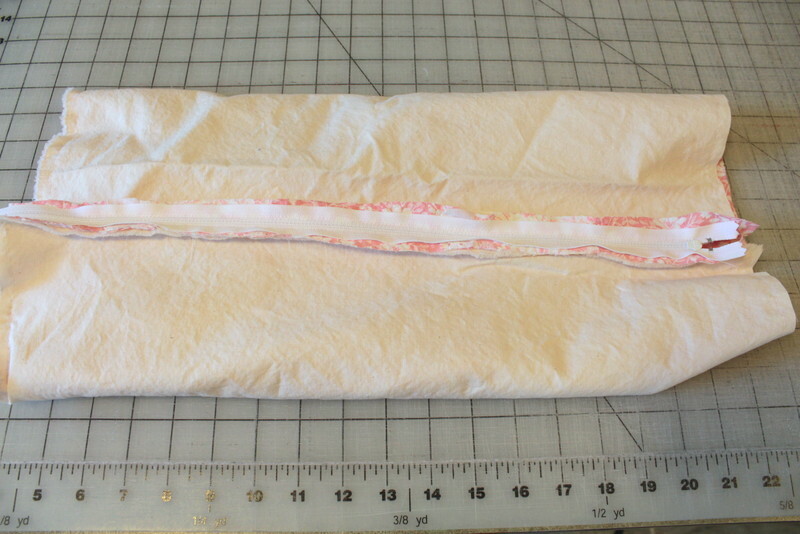 The ends of the bolster are 5″ circles, so I cut my fabric to 6″ to allow for a 1/2″ seam allowance. I found a handy downloadable circle template at Tim’s Printables. 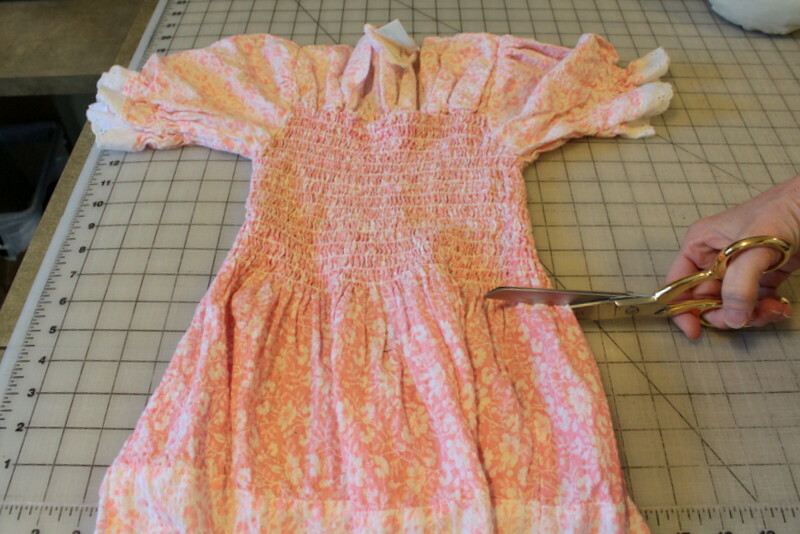 The smocked bodice of the dress is perfect for the circle ends. To determine the size of the tube that encases the pillow form, calculate the circumference of the circle. C = pi x d, where pi = 3.14 and d = diameter of the circle. 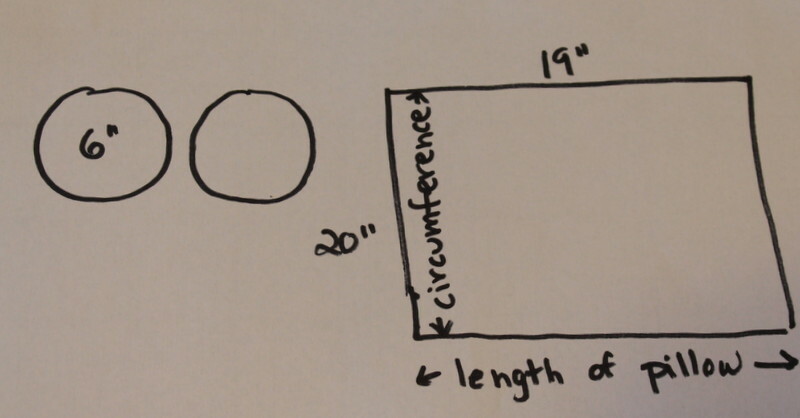 In my case the circumference is 3.14 x 6 = 18.84″. 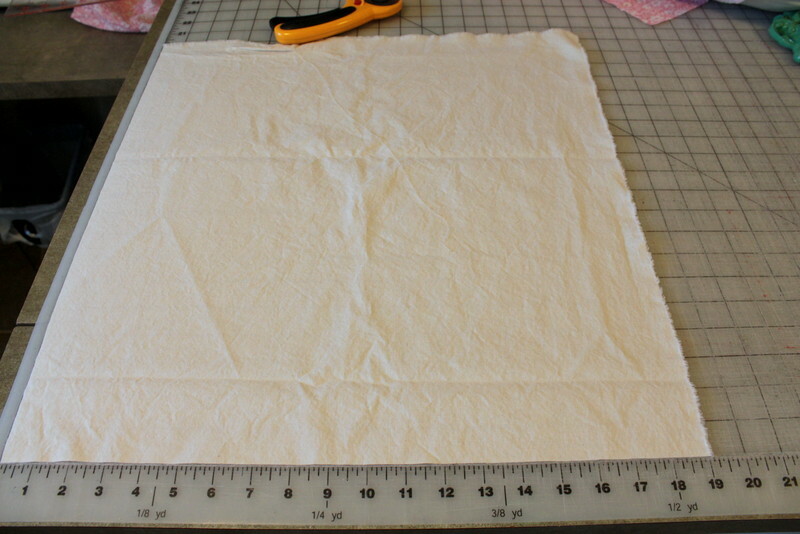 I round that up to 19″ and add an inch for seam allowance. 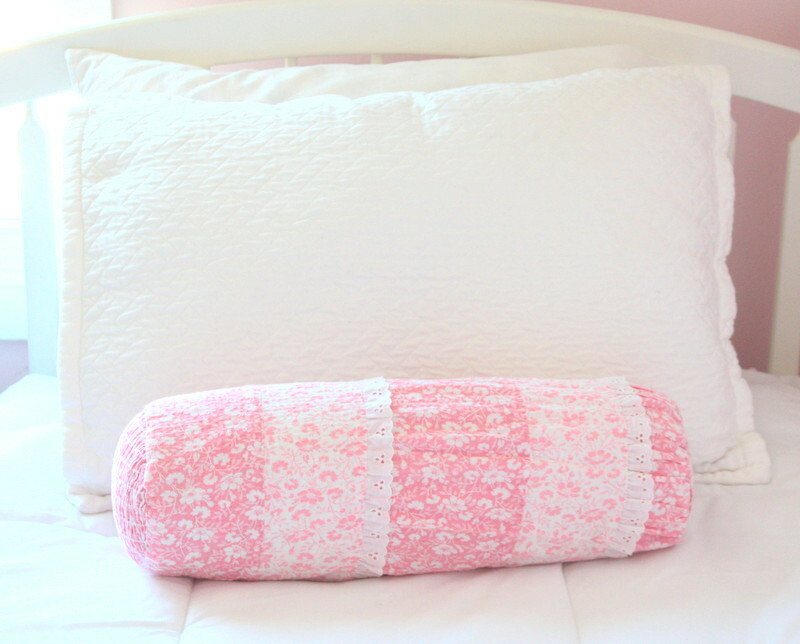 The length of my pillow is 18″, so I need to cut it to 19″. 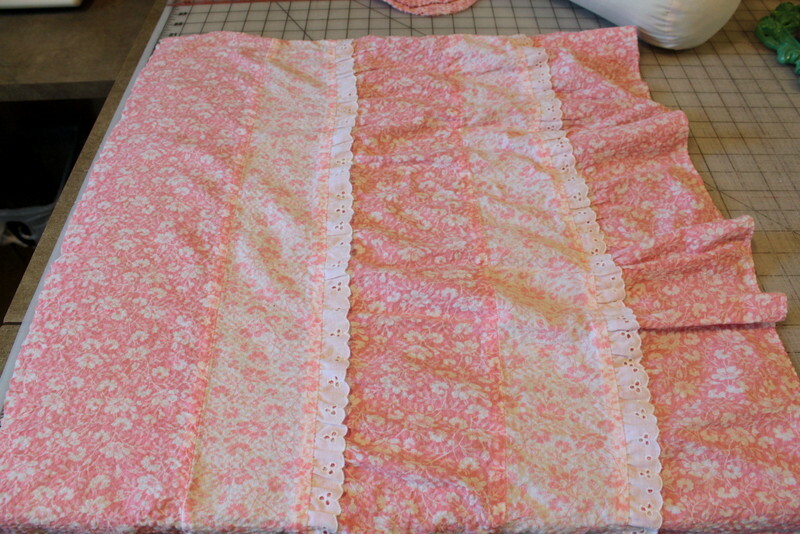 After deciding to use the smocked section for the end circles, I had to determine which direction I wanted to lay the fabric. 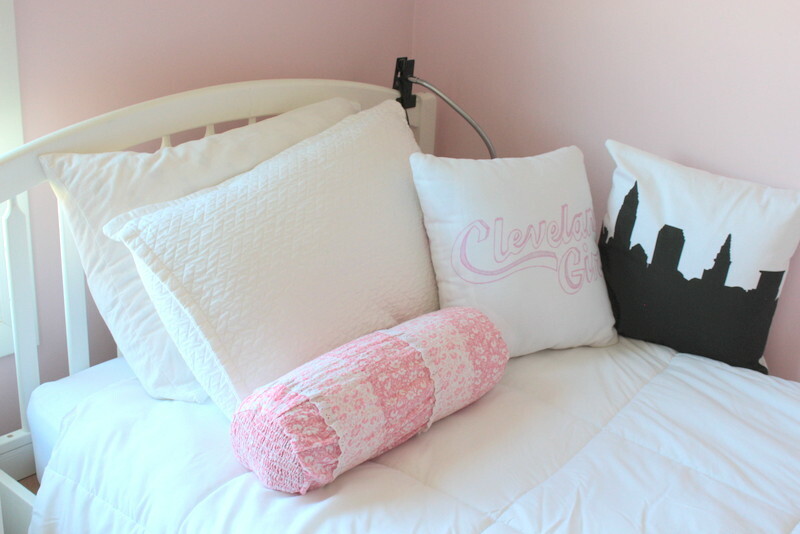 To test the look, I laid the fabric on the pillow. 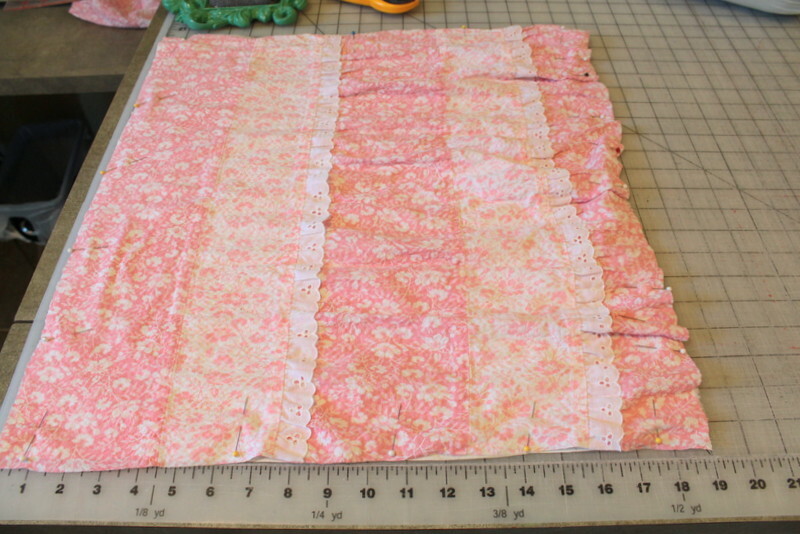 I decided that the ruffles in the fabric would be a challenge on the zipper side of the pillow, so I decided on the layout below. The hardest part of any upcycling project is making the first cut. Just dive in! 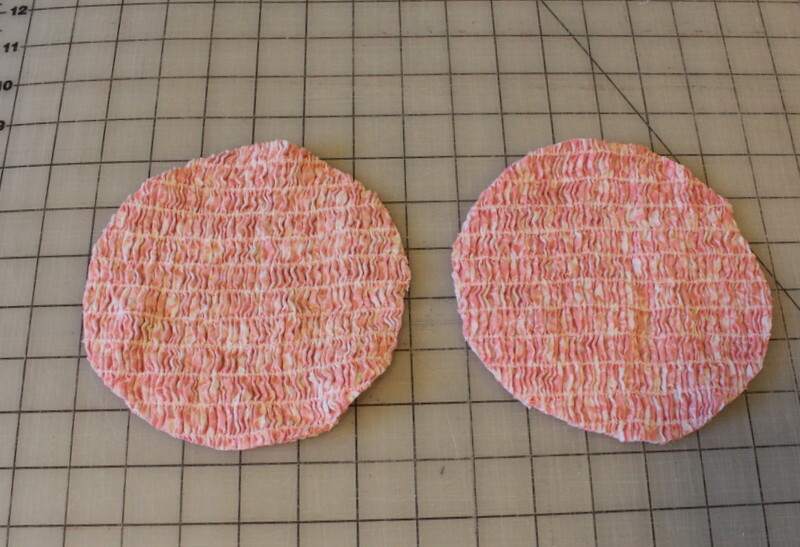 Using the template, cut two 6″ circles. I cut the dress fabric 19″ wide x 20″ high. 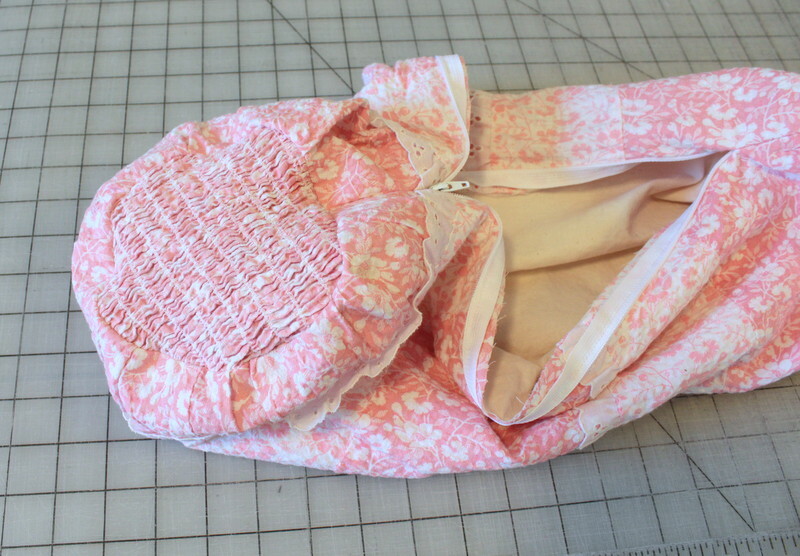 In this view, the top and bottom sides will contain the zipper. 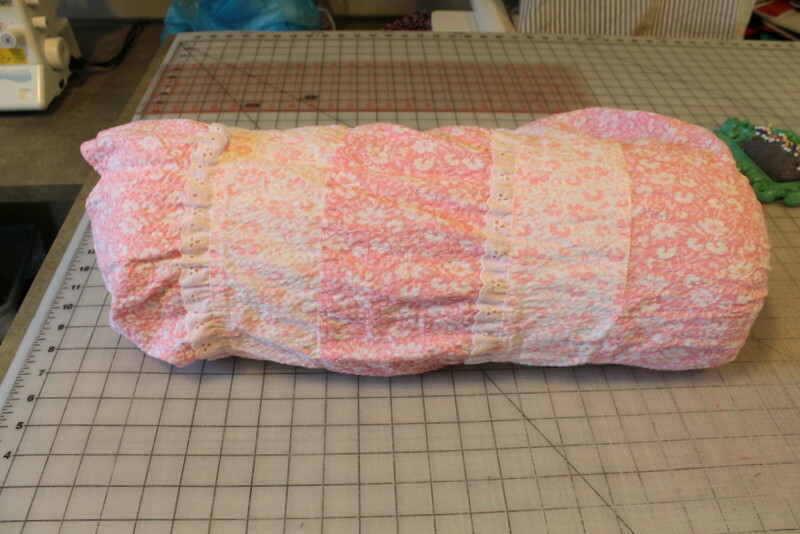 I was concerned that all the gathers would create a problem when making the pillow, so I cut an underlining out of muslin and basted it to the dress piece. There are many ways to insert a zipper. I typically use invisible zippers, but thought it might be complicated inserting into a tube. (In hindsight, it would have been fine to use.) Instead, I used a standard 23″ dress zipper (purchased from Wawak.) I like using longer zippers than what I need because it gives you flexibility in construction. My method, here, to apply the zipper is to place the zipper on the RIGHT side of the fabric with the RIGHT side of the zipper facing down. 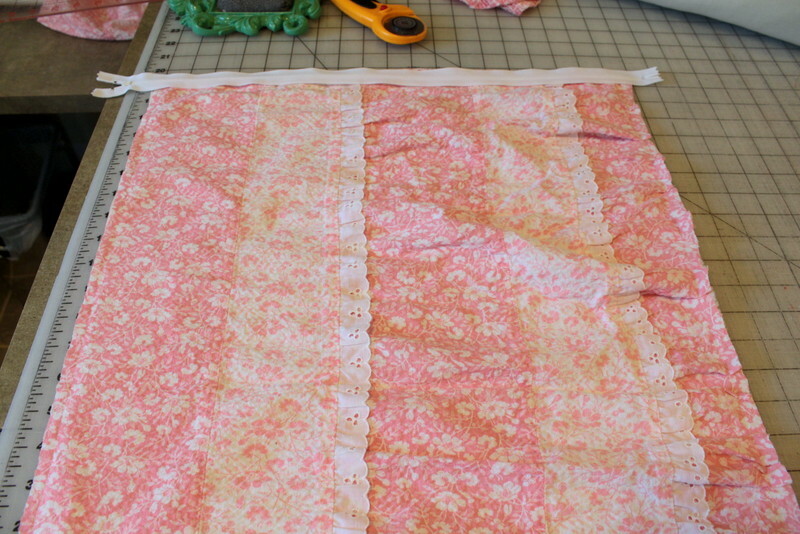 NOTE: If you want to make this project easier, you can eliminate the zipper. 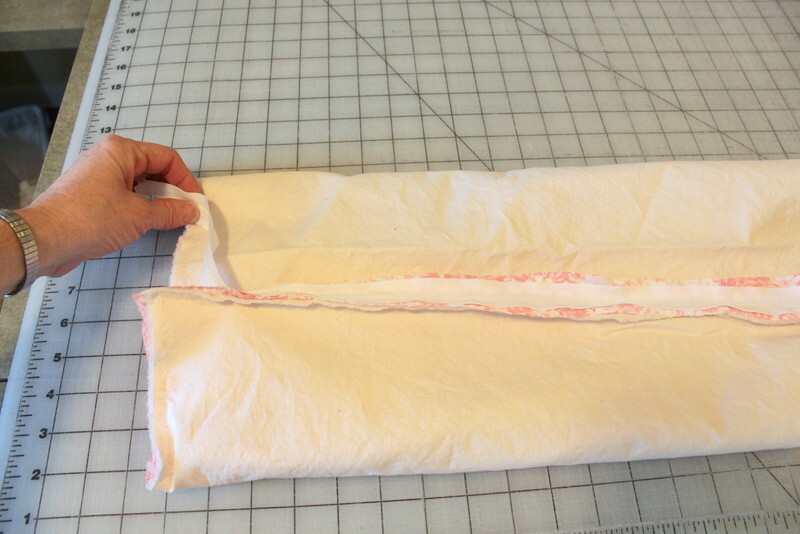 Simply place the right sides together and stitch along the top and bottom of the seam, leaving an opening. 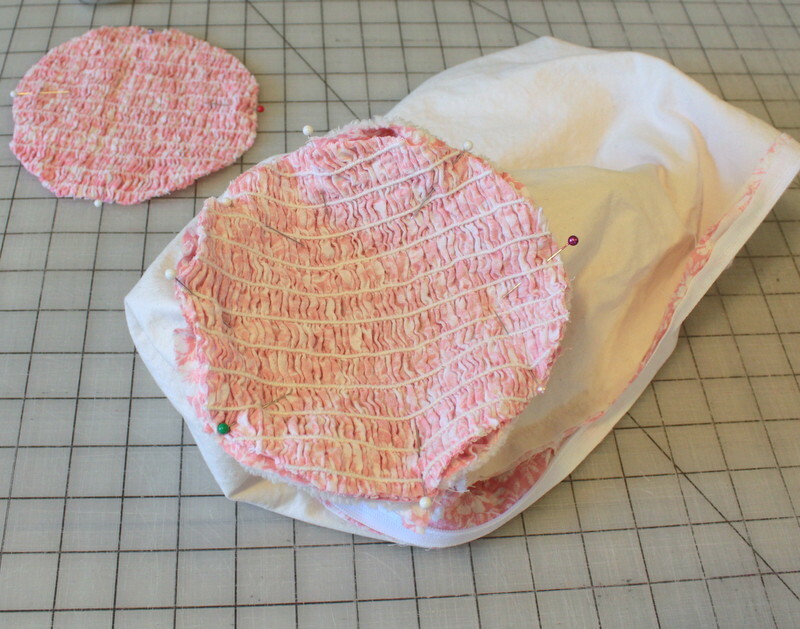 After you sew on the end circles, simply turn inside out and hand sew the opening closed. Unzip the zipper and sew one side of the zipper to the fabric. 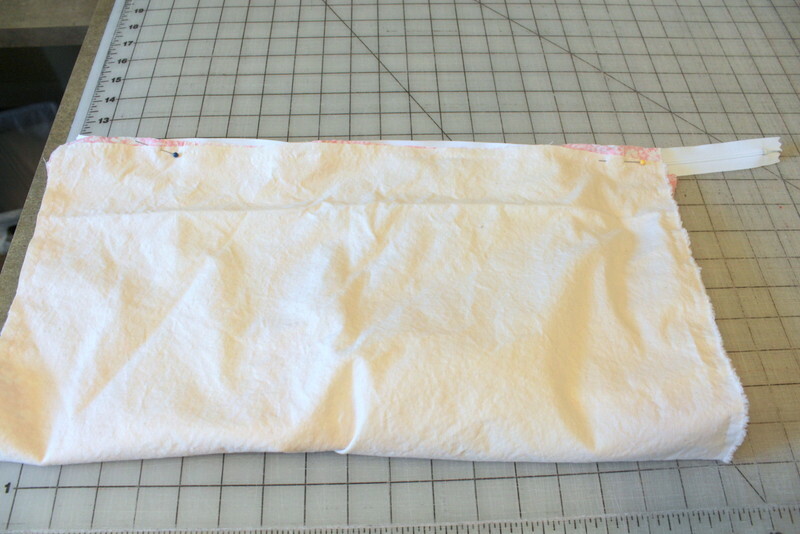 Now, close the zipper, and bring the RIGHT side of the fabric to the RIGHT side of the zipper tape. Pin the zipper and fabric in place. 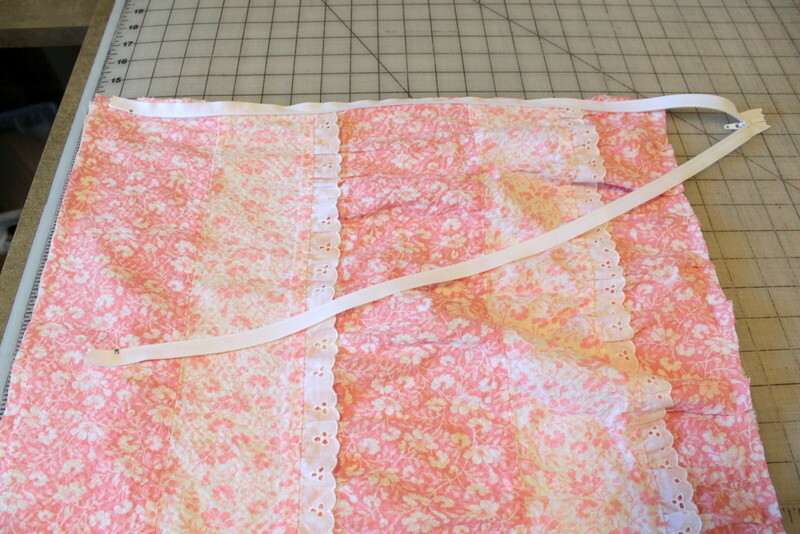 Then, unzip the zipper and stitch it to the fabric. 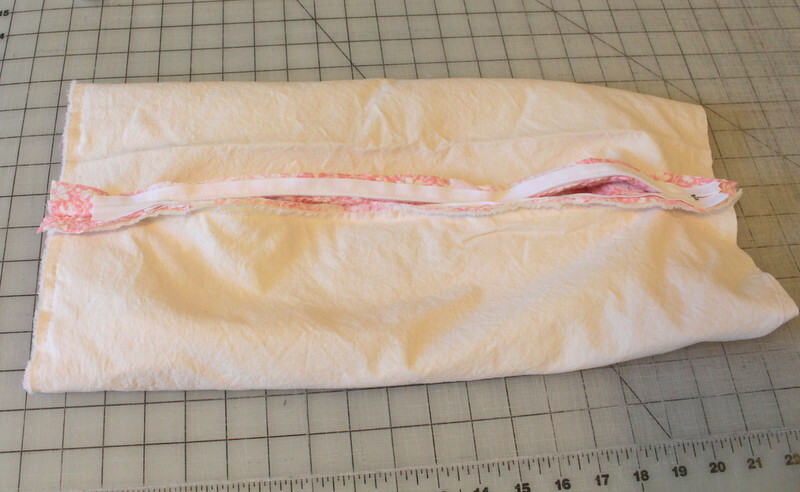 When you close the zipper, you should have a tube of fabric that is inside-out. 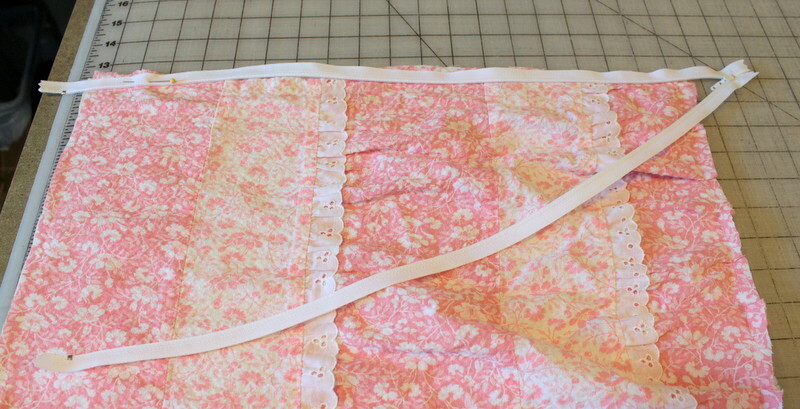 Now, sew the two open ends. 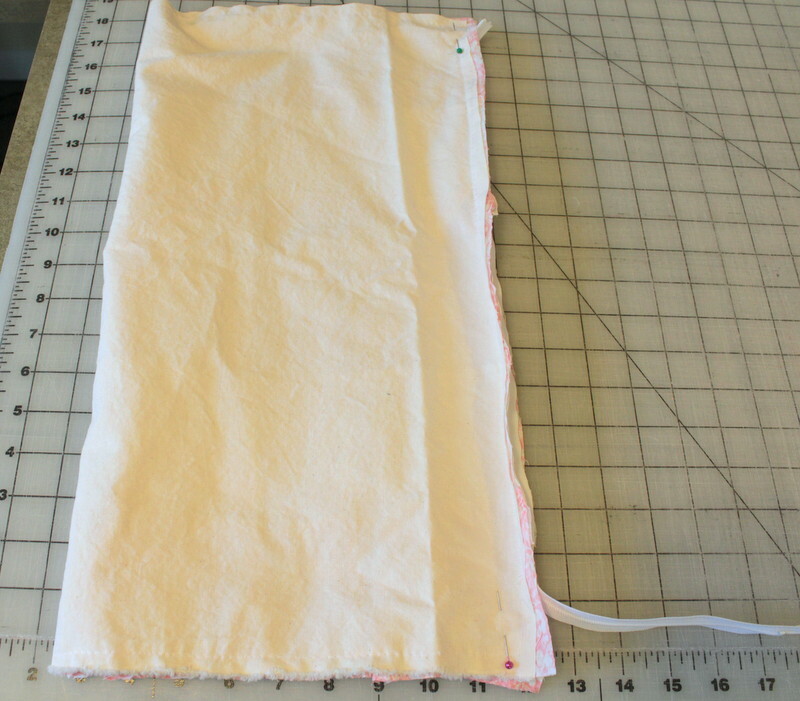 To do this, I pull the zipper out of the way and, using a zipper foot, stitch along the seam line at both ends to complete the seam. 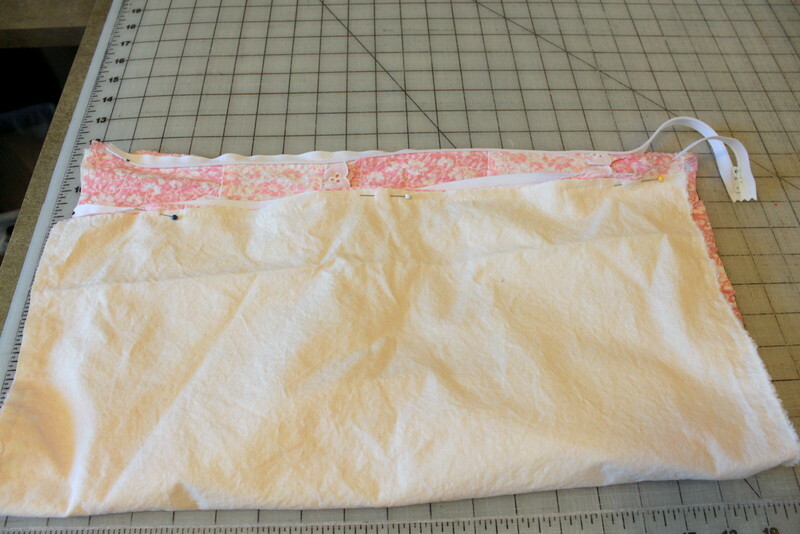 Turned inside out, the tube is completely sewn from one side to the other. 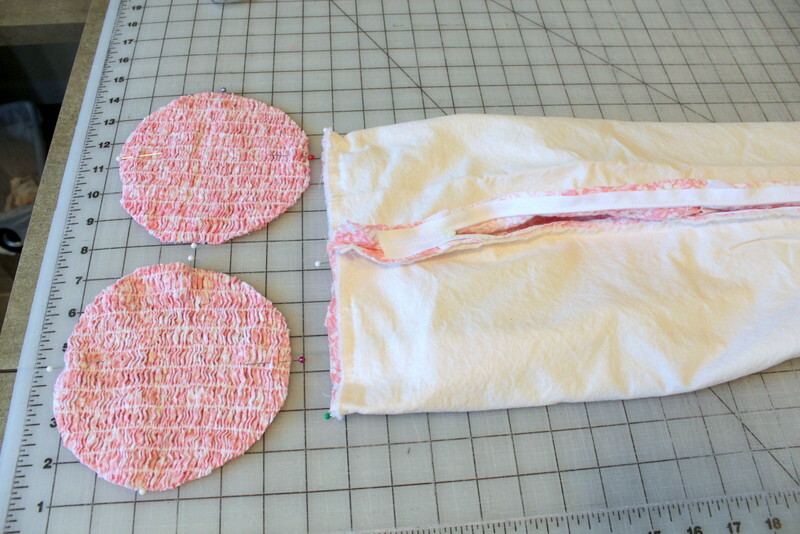 We can now trim off the ends of the zipper and sew on the circles. Divide the circles into quarters and place pins at those points. Do the same with the fabric tube. 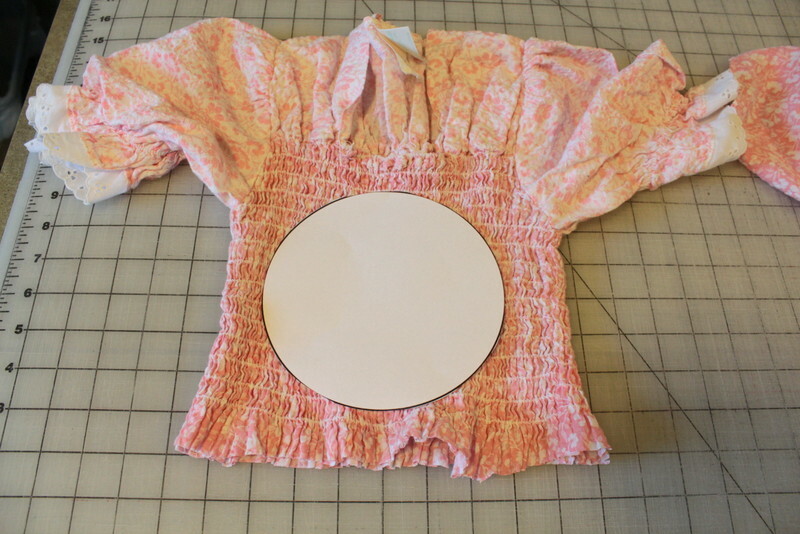 Pin the circle to the tube, easing in the fabric and pinning at about the 1/2″ seam allowance. 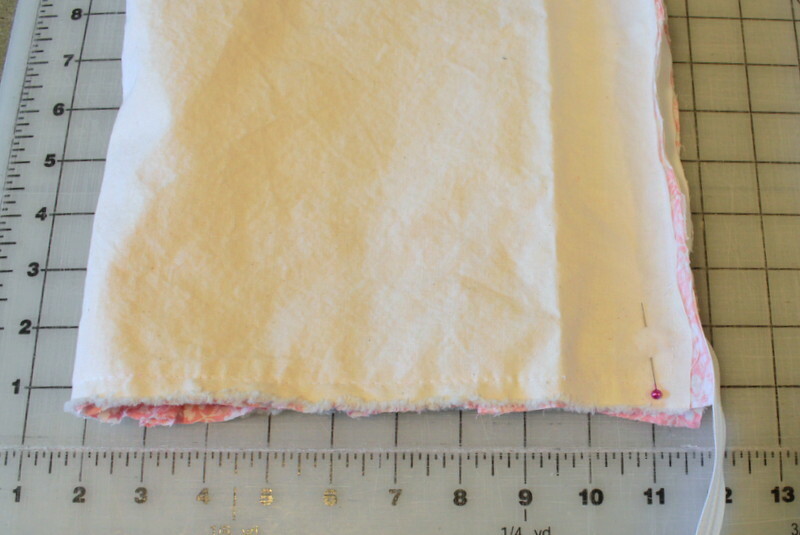 Sew and press the seam. Repeat with the other side. Insert the pillow form, zip it closed and enjoy! 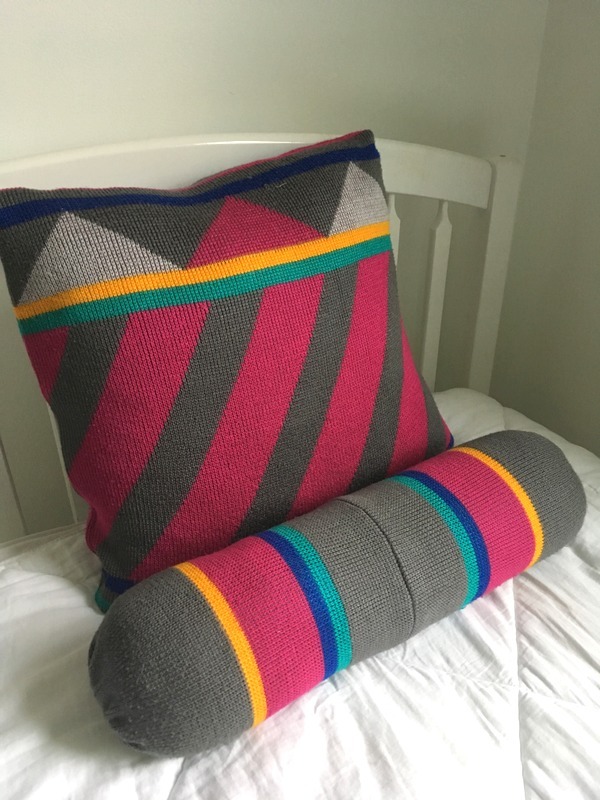 Here’s the upcycled sweater pillow and bolster I made. 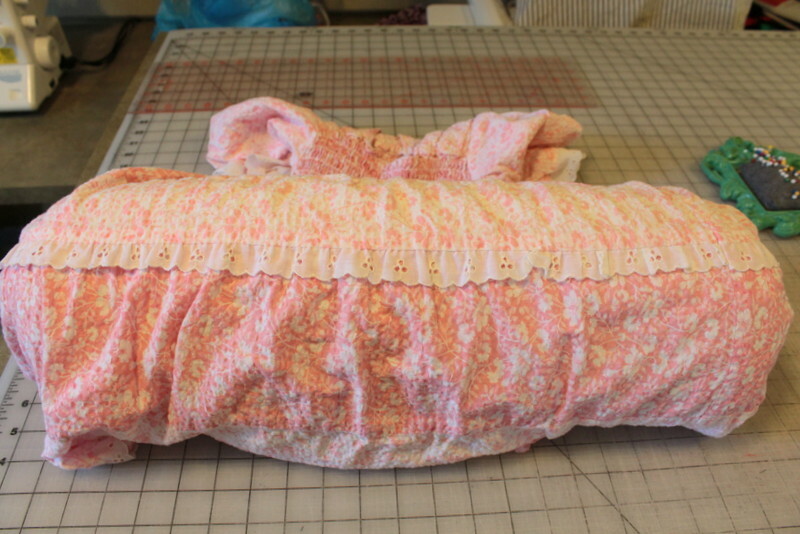 My client asked me to use the sleeves to make the bolster. 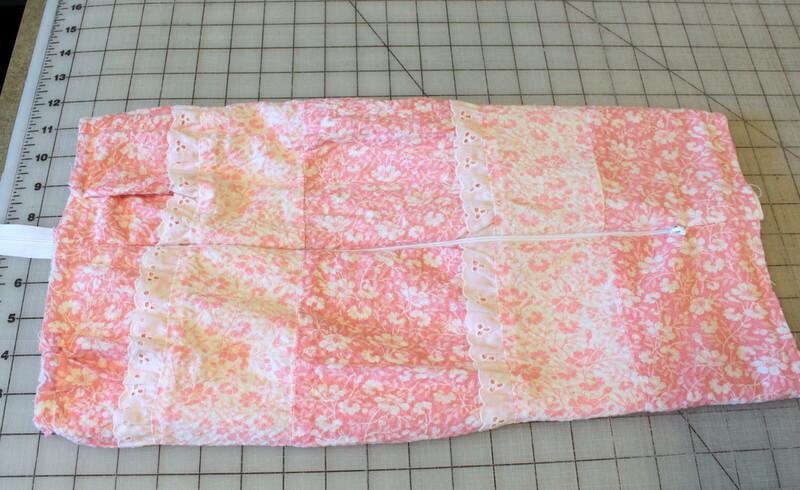 I sewed the sleeves together, slipped in the bolster and hand stitched the two ends closed. A note on Pillow Cubes. I have used their pillow inserts for quite a while. I love them. They are made in America and are nice and full. I buy them in bulk in only one size, 18″, since that is a popular size for my creations. 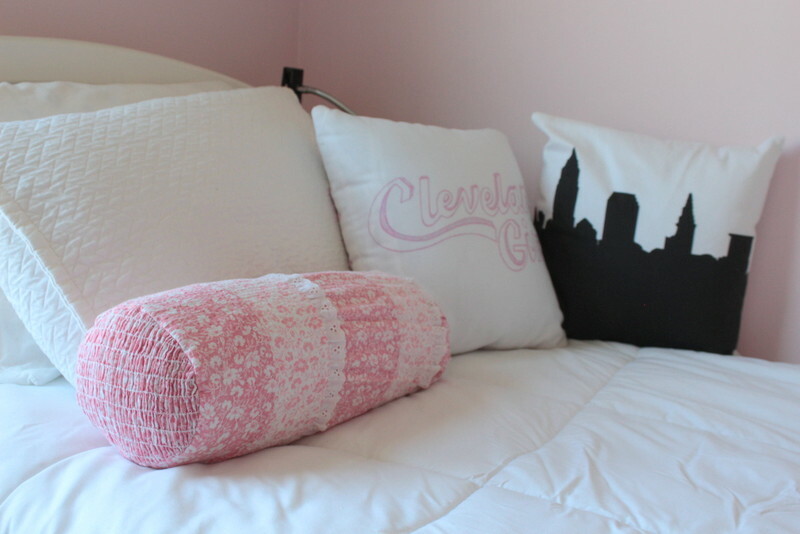 I typically only send a pillow cover to my clients since the pillow form can add bulk and add to shipping prices. However, when my customers purchase a single pillow, they often like me to provide the insert. So Pillow Cubes is my insert of choice. 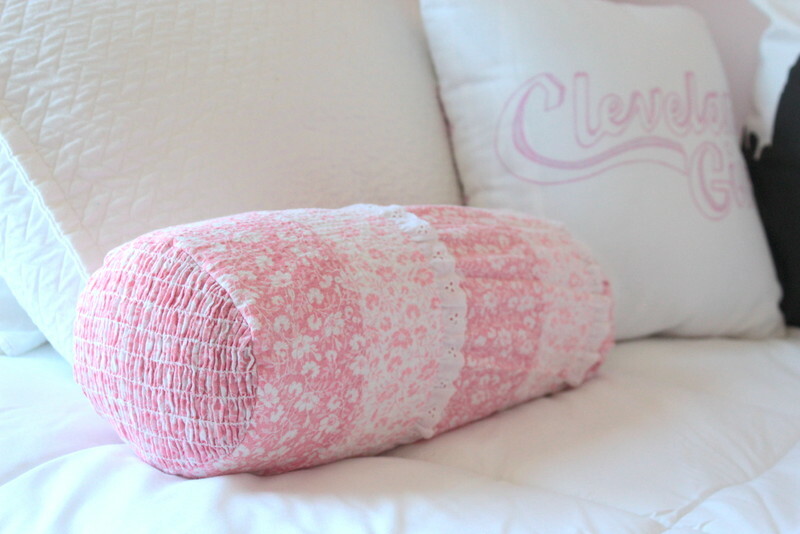 The bolster pillow insert was provided to me by Pillow Cubes to create this tutorial. However, I purchased an additional form to create the sweater bolster. This size is particularly nice and I was unable to purchase it locally. Check them out whether your are a consumer or maker. For makers, there are discounts for bulk purchases.